Lime, grapefruit and peach notes, complemented by tropical aromas. Intense flavours, with great balance. A tight mineral core and creamy middle palate allows for great complexity and a persistent finish. At Waterkloof, we strive to produce balanced, characterful grapes by adhering to traditional organic and biodynamic methods. Chickens, sheep, and work-horses all play their own unique role in the vineyards. Our soils are free of chemicals and are kept healthy by using plant extracts, fungi, and bacteria from our own organic compost. We do not fight nature, we harness it. Our focus has always been to get a better understanding of Waterkloof and the individual characters of its vineyard blocks. The Circumstance range allows these individual blocks and varietals to be expressed. 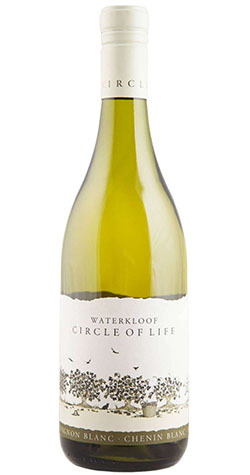 Conversely, our objective with Circle of Life has been to produce two blends that encapsulate all the varying terroir characteristics and grape varietals found on Waterkloof. Thus, rather than being constrained by a traditional blending style, for example, a Bordeaux or Rhône blend, we have instead produced two wines that are not driven by varietal, nor a specific parcel of the vineyard. Instead, they are a true reflection of the totality, philosophy, and specificity of Waterkloof.